In many applications such as forklift trucks or construction machinery, there is a shortage of space for any additional exhaust components so the best option may be to install a combined catalytic converter and silencer into the space previously occupied by the standard silencer. Another advantage of this approach is that the hot surfaces of the catalytic converter will not be on the outside of the unit, thereby reducing the heat transmission into the engine bay and the risk of injury to operators and mechanics. The choice of manufacturing method and materials depends on the physical size of the unit and the batch size. Stainless steel with welded seams is a good option for small batches and non-standard profiles. A more economical option for medium and large batches is to use aluminised mild steel, which is less expensive than stainless steel but is still resistant to corrosion. However, in order to take full advantage of this property it is necessary to use mechanical seaming machines rather than welding, since welding melts off the aluminium and creates a place for corrosion to start. Exhaust seaming machines make use of expensive tooling so in general it is best to design the component in order to make use of the wide range of tooling which is already available. Sometimes catalytic silencers are made from mild or aluminised steel with welded seams, but as this offers little corrosion resistance it is only really a suitable approach for prototypes. 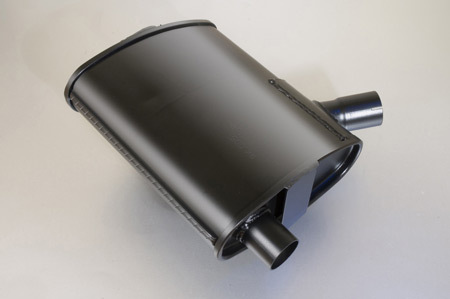 In many sectors the cosmetic appearance of the exhaust system is important, and with this in mind we can supply catalytic silencers finished in heat-resistant black or silver paint. Where additional external corrosion resistance is required they can metal-sprayed with aluminium which is a good option for products which need to tolerate very hostile environments.